We know how gutter cleaning is harder than it looks. Don’t hurt yourself. We’re the professionals. Upfront, Unbeatable, Fair Prices: We clean your gutters and spouts. Avoid a trip to the E.R. We know how convenient cleaning your gutter yourself sounds at first, but the danger behind it isn’t discovered until you find yourself taking a trip to the hospital. We have all the experience and safety training required to be professional gutter cleaners. After the rain, snow and bad weather, your gutter can have a not-so-appealing look. We’ll get the cleaning done right the first time. And during the holiday season, we’ll even climb your roof to help you install Christmas lights! You will discover that we are one of the most polite contractors you’ll ever meet when it comes to finding someone to climb your roof to do some cleaning. Call us to discover how we can become your go-to-professional whenever you need us again! A fully functioning gutter system is an important part of any building’s exterior. Gutters help water and debris flow away from the roof of a building. They direct the water to a designated location, away from the building’s foundation and walkways. Keeping these gutters in working condition is vital. Once gutters become clogged or damaged, leaks in the roof may form. If the foundation gets flooded, it can damage the interior of the building. At Reflection of Perfection, we offer professional gutter cleaning, downspout cleaning, gutter repairs, and maintenance to our clients in Issaquah and North Bend. We work on gutters of all types, and you can count on us for any job, no matter how simple or complicated it may seem. Gutters are the second line of defense in keeping your home safe from the weather. However, gutters only work correctly if they are clear and free of debris. We understand the importance of maintaining a fully functioning gutter system and it’s our job to make sure your gutters are unclogged, undamaged, and in working condition. We offer a full range of gutter services, from regular maintenance to emergency repair and work on both residential and commercial buildings. Our experts are ready to inspect the current condition of your gutters to make sure they are working efficiently. Who needs professional gutter cleaning? All homes and buildings have gutters and downspouts installed around the premises. The purpose of these gutters is to protect the integrity of the roof, and they also prevent flooding around the foundation. At Reflection of Perfection, we offer professional gutter cleaning to our clients. Gutter cleaning is important for both homeowners and business owners. Over time, all gutters will fill with debris, including leaves, dirt, and even nests. 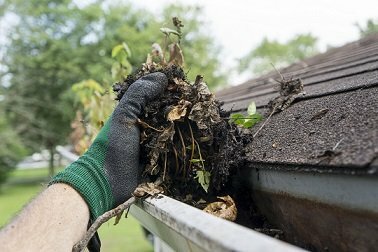 Cleaning out this debris is a vital part of maintaining the condition of your gutters, thus helping them last much longer. Gutter cleaning is a very complex, difficult, and often dangerous job. There are a lot of precautions that must be taken in order to ensure the safety of those doing the cleaning, as well as protecting the gutters from damage. Our professional team has the expertise to safely and effectively clean your gutters. Hiring our professional gutter maintenance service also saves you both time and money. We know how to properly clear debris from all parts of your gutters, including downspouts and joints. It doesn’t matter if you have a simple or complex gutter system, we have the skills and tools needed to get your job done right. Why should you not clean gutters on your own? No one should ever try to clean their gutters without the help of a professional. While there are many DIY methods out there, none of them are as safe for you and your gutters as calling in our team at Reflection of Perfection. Cleaning your own gutters may lead to an accident or even a trip to the emergency room. Falls are very common when homeowners try to clean their own gutters. It’s also possible to cause unfixable damage to your gutters by attempting to clean them on your own. Our team of professionals, however, has the experience needed to get your gutters and downspouts cleaned in a safe, effective manner. When you hire us, you are getting the best gutter and downspout cleaning in the area. We have the right tools, and our team has been thoroughly trained to keep your gutters free from damage while we work our magic. The cleaning services we provide will keep your gutters functioning properly, protecting your roof and landscape from leaking and flooding. By completing our job properly, your gutters will stay clean longer than if you were to do them yourself. It’s our goal to make sure your gutters and downspouts are in like-new condition when we leave. Why is our company the best choice? When it comes to keeping your gutters clean and free of debris, you can count on us to get the job done right at Reflection of Perfection. Our professional gutter cleaning service has received rave reviews from our past customers. In fact, many of them return to us time and time again to keep their gutters in great condition. We are proud of our 5-star reviews, and we strive to make sure every customer is completely satisfied with the service they received. It’s our mission to turn every client into a repeat customer. We can handle all aspects of gutter cleaning, including debris removal, downspout cleaning, and even repairs. Our team has the experience needed to make sure every job is completed both properly and on time. Everyone on our crew is polite, and we are always careful on the job. You’ll be pleasantly surprised by our fair, competitive pricing. The next time you need your gutters serviced, remember to give us a call! You can reach our office weekdays from 7am-6pm. We even work on Saturdays by appointment. When it comes to cleaning and repairing gutters, no one can beat our top notch service and expert work. Q: When is the best time to get my gutters cleaned? A: Anytime is great but we recommend fall. Q: How do you clean the inside of my gutters? A: We remove the debris from inside the gutters and we always make sure to clean up after ourselves before we leave. Downspout cleaning is a difficult DIY task, especially without the right tools. We check and make sure all downspouts are flowing correctly. Q: How do you clean the exterior of my gutters? A: We soft-wash the exterior gutter faces. This process is usually done in combination with a house wash and exterior window cleaning service. Q: Should I get gutter protection installed? A: Only if your gutter cleaning needs exceed four times a year. There is no such thing as a maintenance free gutter. Even with protection, we recommend annual gutter cleanings. Q: Why is it important to use professional gutter cleaning companies? A: Getting your gutters cleaned by a professional at least once a year is important because: 1. It keeps you safe and off a ladder, 2. Prevents damage by keeping water flowing away from your home, and 3. We are able to inspect your roof and gutter for other problems that may not appear obvious to the homeowner, but could be very costly down the road.